MID-WEEK PREVIEW: As the competition progresses, games become must-wins for sides looking to stay in the race such as THW Kiel and Dinamo Bucuresti. La Trocardiere hall was HBC Nantes’ fortress last season, with the French team losing only once in eight games in the VELUX EHF Champions League. Their resolve will surely be tested against the powerful Lions, who are looking to extend their unbeaten streak. Another German side, THW Kiel, are looking for their first win, after a painful 32:21 loss against PGE Vive Kielce. But their opponent Aalborg Handbold have been buoyed by winning their first game after a three-year hiatus in the European top-flight competition. Meanwhile, the match between Dinamo Bucuresti and Kadetten Schaffhausen is crucial, as both sides are looking to keep pace with Skjern Handbold and Rk Gorenje Velenje. Löwen are looking to remain unbeaten against Nantes, as the German side is boasting the best attack in the group. Wednesday 27 September, 18:30 hrs local time, live on ehfTV.com. Last year’s surprise contenders, Nantes, enjoyed a bright start in a tough group, as they put intense pressure on the title holders Vardar in a hard-fought 27:23 loss on Saturday. The French side is now back on home court, where they have lost only once in eight games in the VELUX EHF Champions League. However, their opponents are the current German champions, Rhein-Neckar Löwen, who lost only one game this season, when they lost to Flensburg in the Bundesliga. A convincing 31:27 win against Orlen Wisla Plock last week was followed by a 36:27 drubbing of TuS Lübbecke in the Bundesliga, both of which serve to underline the Lions’ ambitions for the season. “We need to be at optimal strength in every game, there should be no moments in which we are relaxed,” said Andre Schmid, Löwen’s playmaker, who has scored 10 goals so far this season in the European top-flight competition. A sharper attack is needed for Nantes to cope with Löwen, as the French side has scored the fourth-lowest number of goals of the teams in Groups A and B. Particularly, Kiril Lazarov will be looking to improve his performance, as he has only scored twice this season. Nantes will be hoping that the atmosphere on home court will help them to perform. At the start of the season, if Kiel were to have imagined a worst-case scenario, it would surely have been to be sitting at the bottom of the group after two rounds. Kiel’s ambitions were huge for this season, but two consecutive defeats at the hands of PSG and PGE Vive Kielce forced Alfred Gislason’s side back to the drawing board. While progress to the next round is not out of question right now, a 11-goal drubbing at the hands of Kielce will surely pose significant questions about Kiel’s chances this season. However, their game against Aalborg could offer the opportunity that Kiel need. 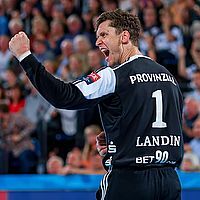 The Danish side have progressed to the Last 16 phase in both of the seasons they played in the VELUX EHF Champions League, but this season represents their biggest challenge yet in the European top competition. A narrow win against Celje, 32:30, boosted Aalborg’s hopes, and the Danish sides have impressed this season after losing their star Sander Sagosen to PSG. Kiel will find themselves without captain Domagoj Duvnjak again and long-term absentee Raul Santos. Further, Niclas Ekberg is a doubt, after being knocked unconscious in the loss to Kielce. However, coach Alfred Gislason is expected to resume his duty on Wednesday, after missing the previous game due to a back operation. Wednesday 27 September, 19:00 hrs local time, live on ehfTV.com. There is no room for error now for Dinamo, as they lost both of their first two games of the season, against Skjern and Gorenje, both of whom have four points. “We definitely need to win the game against Kadetten to have a chance for the next phase,” said Marius Mocanu, Dinamo’s line player, echoing the feeling of the Romanian team overall. Kadetten’s tough schedule could help the hosts, as the Swiss side will play their second game in only three days, after the tough 29:28 away loss against Abanca Ademar Leon. Particularly, veteran players like Gabor Csaszar or Manuel Liniger could be impacted by the hectic timetable, as Dinamo had an extra day of rest, and play both games at home, in front of their fans. The “red dogs” will need more in attack, after a lackluster 53% shot efficiency against Velenje. Dinamo’s top player from last year, Sajad Esteki, has scored only nine goals in two games and has been uninspiring in attack. Tapping his enormous potential could be key for the “red dogs”. On the other hand, Kadetten have likely almost forgotten about their win against Elverum Handball, and are instead looking to keep pace with group leaders Skjern and Velenje, who will face each other this weekend.